Preparation of yeast dough takes a longer time than fresh or sand, and yet the result is worth it. Sincere appreciation to the home for the meal will be well-deserved reward to the mistress. This simple recipe will help you bake a lush pies with any filling - sweet, cold or sharp. 15 g of pressed or half sachet of dry yeast dissolve in half of glass of warm boiled water, adding a teaspoon of sugar. Wait until the yeast rises lush foam and mix them with 0.5 Cup of warm sour cream, 2 eggs, which need in advance remove from the refrigerator, and a half Cup vegetable or melted butter. Products should be warm so that the dough is better suited. Mix the products, add a tablespoon of sugar, 0.5 teaspoons of salt and enough sifted flour to reach the condition of liquid sour cream. Leave the pan with the dough for 25 minutes in a warm place, then stir in 2-2,5 cups flour. The dough should be soft and elastic but not stick to hands. Grease hands with vegetable oil, table sprinkle with flour and carefully knead the dough to make the pies were lush and delicious. The finished dough cover with a cloth and put in a warm place for 1.5-2 hours. At this time, take the filling - it must be completely cool by the time, as the dough will do. When the dough has risen about 2 times, still pomnite it for 5 minutes and divide it into 2 parts - bigger and smaller, it will be the top and bottom of the pie. 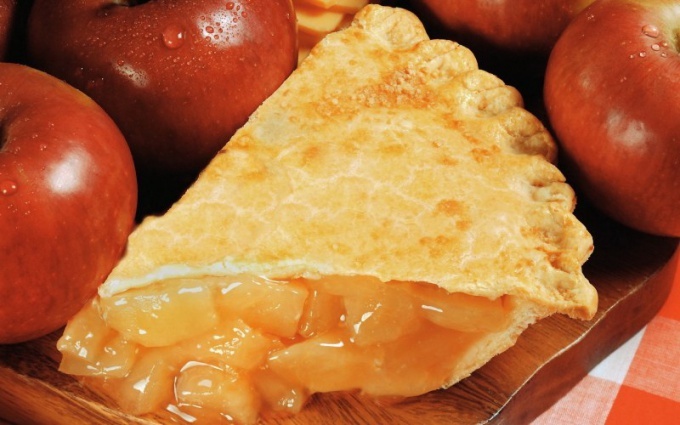 If you are going to make small pies, divide the dough into pieces the size of an average Apple. Again leave to rise for 15 minutes, then a large part intended for the bottom, roll it out on a warm, greased with vegetable oil baking sheet and place it on the filling. If you make sweet pie, the second part of the dough divide into small pieces, roll them into sausages and place the mesh on the cake, that will hold the filling. If a pie with meat or vegetable stuffing, then cover take entire, carefully samipya the edges of the dough and beautifully podrachivaya them. Again, leave the cake in a warm place for 10 minutes, then lubricate it with oil or mash out of milk and eggs to have beautiful shiny crust, prick the top with fork in several places and place in oven preheated to 180 degrees. So the pie did not burn under the pan on the bottom of the oven you can put a pot of water - vapor from it will protect your product. When the dough is slightly browned, reduce heat to 100 degrees and bake pie until done. Viennoiseries can not bring to the table piping hot - you need to cover them with a towel or cloth made of natural fabric for 10 minutes. Meat filling for the pie is made the same as for pasties. Very tasty pies with cabbage. Shred the cabbage finely and fry on low heat under a lid, stirring frequently. Salt, when it will be ready. Finely chop 2-3 hard-boiled eggs, cut green onions and add to cabbage ground beef. Sweet fillings can be made from apples. Cut the fruit into slices, add sugar to taste and starch to the resulting juice flowed out of the pie on a baking sheet. The need to add sugar directly before you spread the filling over the dough.